This PDF 1.5 document has been generated by Acrobat PDFMaker 10.1 for Word / Adobe PDF Library 10.0; modified using iText 2.1.7 by 1T3XT, and has been sent on pdf-archive.com on 04/11/2015 at 00:05, from IP address 216.49.x.x. The current document download page has been viewed 362 times. File size: 135 KB (18 pages). a judgment by default. Hoskin v. Younger Cemetery Corp., Inc. 838 S.W.2d 476, 479 (Mo. App. E.D. 1992) (citing, Gibson by Woodall v. Elley, 778 S.W.2d 851, 854 (Mo. App. 1989)). is a good deal narrower than the discretion to set aside said judgment.” Id. (citing, Schulte v.
Venture Stores, 832 S.W.2d 13, 15 (Mo. App.1992)). the Default Judgment entered against WBDP must be set aside. attached and incorporated by reference for all purposes. Undelivered Envelope (Judgment) addressed to WBDP (f. 6/5/15). readily verified as part of the Court’s file, maintained by the Court Clerk. actually served, and never actually received the Summons and Original Petition. 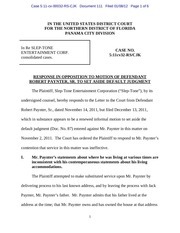 had not, in fact, sent WBDP any of the papers (the Summons and Petition) concerning the lawsuit. 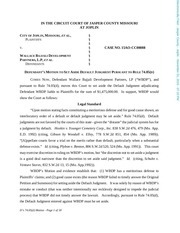 against WBDP – at a time when WBDP was unaware that these claims were being adjudicated. We are returning documents served received for [WBDP]. records was returned as undeliverable. resignation of agent in all states where permitted. not have any address to which to forward the papers. Ex. C-3 (Letter from CT). Included with the letter which CT sent by regular mail to Mr.
Blanchard was the Summons and Original Petition which CT had received from the process server. Service with the Court Clerk, representing that Defendant WBDP had been properly served. Exs. “discontinued”, Plaintiffs told the Court that WBDP had been “properly served”. 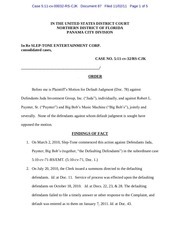 Plaintiffs presented their Motion for Default Judgment to the Court on May 13, 2015.
address to forward the process. 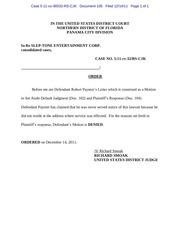 Plaintiffs for $1,475,000.00 in damages Ex. C (Docket Entry Sheet); Ex. C-6. issued to each has never been served. Ex. C.
third parties of whom the court cannot acquire jurisdiction. v. City of Caruthersville, 359 Mo. 282, 221 S.W.2d 471, 474 (1949) (emphasis added). are precluded in a later action between the same parties or those in privity with them. counterclaim rule as a special application of the principles of res judicata. Rule 55.32 is based on Federal Rule 13(a). Ashford Road [Suite 150] Sugar Land, Texas 77478) (the “2011 Office Address”). Ex. C-2. Original Petition. Ex. C-1, p. 2, at ¶ 8.
statutory representation services to WBDP on January 1, 2015. Ex. C-4; Ex. B, at ¶¶ 4-5.
fact, CT had returned the documents (the Summons and Original Petition) to Plaintiffs’ counsel. Default Judgment. Exs. A at ¶¶ 3-5; A-1; A-2; B; C-3; C-4; C-5; and C-6. unaware of any obligation to file an Answer or other responsive pleadings; therefore, it did not. Ex. because Mr. Wallace had sought bankruptcy protection, WBDP believed that the case was stayed. the Correct Office Address). Id. the State of Missouri. Ex. A, at ¶ 6.
which WDBP had not used in more than three years. representation services as WBDP’s registered agent. because it did not have WBDP’s valid address. process to WBDP because it did not have WBDP’s valid address. 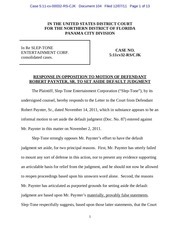 had returned the process to Plaintiffs’ counsel. pleadings, or that Plaintiffs’ claims were being adjudicated. (Mo. banc 1976); Pyle v Firstline Transport. Sec., Inc., 230 S.W.3d 52, 57 (Mo. App. W.D. 2007). holds for default judgments. Gibson by Woodall v. Elley, 778 S.W.2d 851, 854 (Mo. App. 1989). Courts favor a trial on the merits instead of a default, particularly when a substantial defense exists. interfere when the trial court has denied the motion to set aside. Schulte, 832 S.W.2d at 15. Pyle, 230 S.W.3d at 57 (citing, In re Marriage of Macomb, 169 S.W.3d 191, 193 (Mo. App. 2005)). 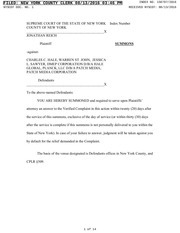 subsequently misfiled by a clerical worker at Defendant’s office. Id. at 61. This file has been shared by a user of PDF Archive. Document ID: 00312470.